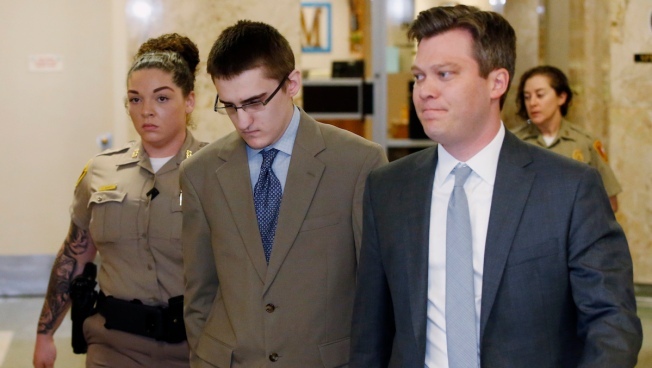 In this Tuesday, April 17, 2018, file photo, Michael Bever, center, is led from a courtroom in Tulsa, Okla.
A 19-year-old Oklahoma man convicted of stabbing his parents and three siblings to death was sentenced Thursday to five life terms in prison to run consecutively, meaning that even with the possibility of parole he likely won't ever be released. Michael Bever was 16 years old in 2015 when prosecutors say he and his older brother, Robert Bever, killed their mother, father, two younger brothers and 5-year-old sister at their suburban Tulsa home. Two other sisters survived the attack. Robert Bever, who was 18 at the time of the killings, pleaded guilty in 2016 and was sentenced to life in prison without parole. Michael Bever was convicted in May of five counts of first-degree murder. The jury also convicted Michael Bever of one count of assault and battery with intent to kill for wounding his then-13-year-old sister, who survived the attack. A 2-year-old sister was unharmed. On Thursday, Bever was sentenced to 28 years in prison for the assault on his 13-year-old sister, in addition to the five life sentences. Authorities have never revealed the teens' motives in the slayings. Neighbors said the children were all home-schooled and that their parents kept them on a tight leash, forbidding them from mingling with neighbors or playing with kids outside the family. Following the attack, Robert Bever told police his parents beat him. He said his father once dragged him upstairs because he left a light on and his mother slapped him so hard it left a mark. He described to police how he planned to murder his parents and siblings and that he hoped killing them would bring him fame. Defense attorneys argued that Michael Bever was led astray by his older brother, and Robert Bever testified that he wanted to take responsibility for all of the killings. Prosecutors, who urged the judge to award a no-parole sentence ahead of Thursday's hearing, argued that Michael Bever was a willing participant in the gruesome killings and that he should be locked up for the rest of his life. The sentencing Thursday effectively achieves that. Life sentences are considered 45 years for parole purposes in Oklahoma, and inmates must serve 85 percent of each sentence before technically being eligible for parole. Calculated consecutively, Bever's sentences total 253 years and he must serve 85 percent, or 215 years, before he reaches parole eligibility. Bever's defense attorneys said they plan to appeal his sentences.